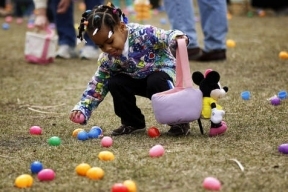 The Prairie District Neighborhood Alliance will host its Annual Easter Egg Hunt, at Chicago’s Women’s Park and Gardens featuring a variety of family activities, on Saturday, April 19 from 12:00 p.m. to 2 p.m. This popular holiday event is expected to draw over 2000 people from the South Loop and surrounding communities. The Easter Egg hunt will begin at 12:15 p.m. During the hunt, children will search for over 10,000 brightly colored toy and candy filled plastic eggs and will be able to win prizes. The egg hunt is recommended for children ages 12 and under. There will be separate designated areas for the hunt, with an area for the younger children and an area for the older children. Children should bring their own Easter basket and must be accompanied by an adult. The PDNA is very excited to partner with the Chicago White Sox and will give away 200 White Sox game tickets and 150 Brookfield Zoo tickets at the hunt. White Sox mascot, Southpaw will also be at the event to visit with the children. The Chicago Women’s Park and Gardens is located 1801 S. Indiana Avenue in Chicago. Admission is $12 for children and $4 for age 13 years to adult. There is no charge for children age 12 months and under. Space is limited and RSVP is Required. For more information or to purchase tickets, visit the PDNA web site at: www.pdnachicago.com or call (312) 401-2688.